On the road with a big bright red overland truck was a good feeling. I was moving. 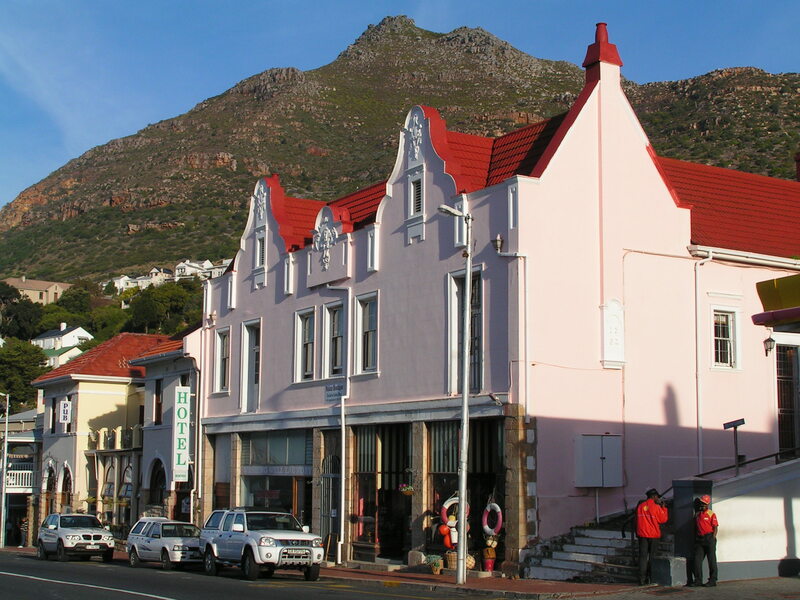 Cape Town was organised, modern and was quite unlike an African township. However, just on its fringes on Highway 1, shanty towns appeared. The appearance of cramped houses with corrugated iron roof, narrow dirt lanes, poor hygiene and sanitary, broken down vehicles and clothing drying off strings attached between houses were the tell-tale signs. There were several along the way. 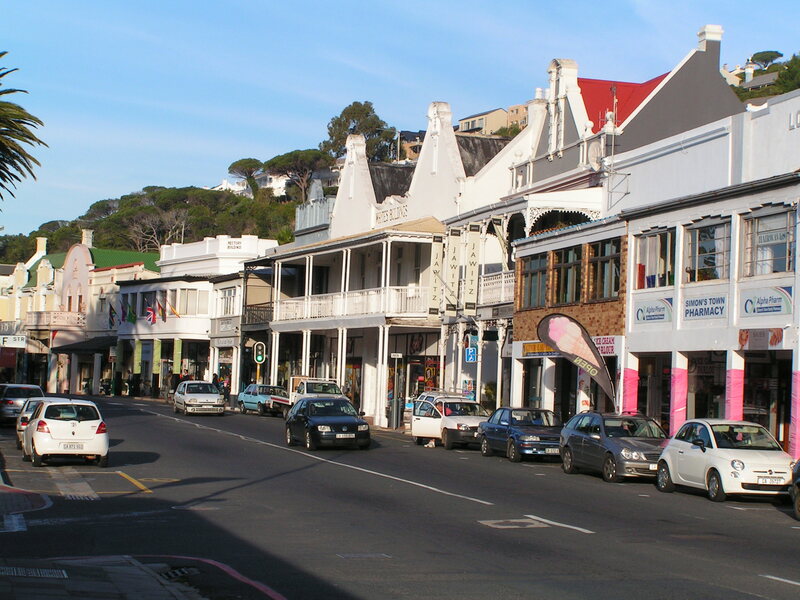 It was in contrast to the neat, picturesque coastal townships of Cape Town. Poverty is real and evident here. This is the Cape Flats where during the apartheid days, the black population was forcefully removed from Cape Town and resettled here. This included people from District Six. 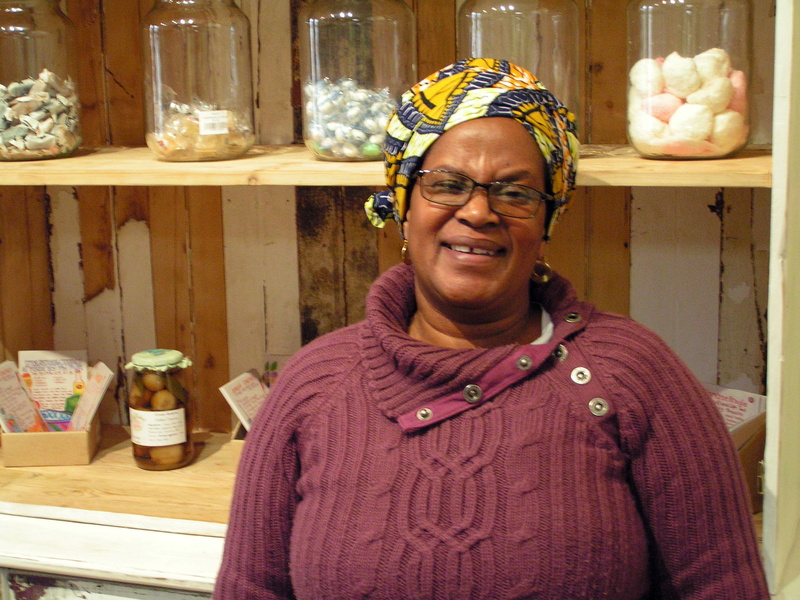 Little or no efforts had been made to reintegrate these people into mainstream Cape Town. They still struggle to get basic amenities like clean water, power and sewage. Is it deliberate – to divide and rule. On reflection, Cape Town is predominately occupied by the white population. Perhaps there is a conspiracy where the ruling ANC government is sleeping with the white controlled economy! After a long drive north in a dry landscape, the route diverts inland and a desert like environment. Soon, high mountains dominate the horizon. The journey meandered through the dusty gravel roads, sometimes with river crossings, to reach an oasis dominated by tall trees and vertical orange sandstone mountains. A crystal clear river flowed nearby. The sun was high but rapidly setting against a deep blue sky. This is Camp Algeria. 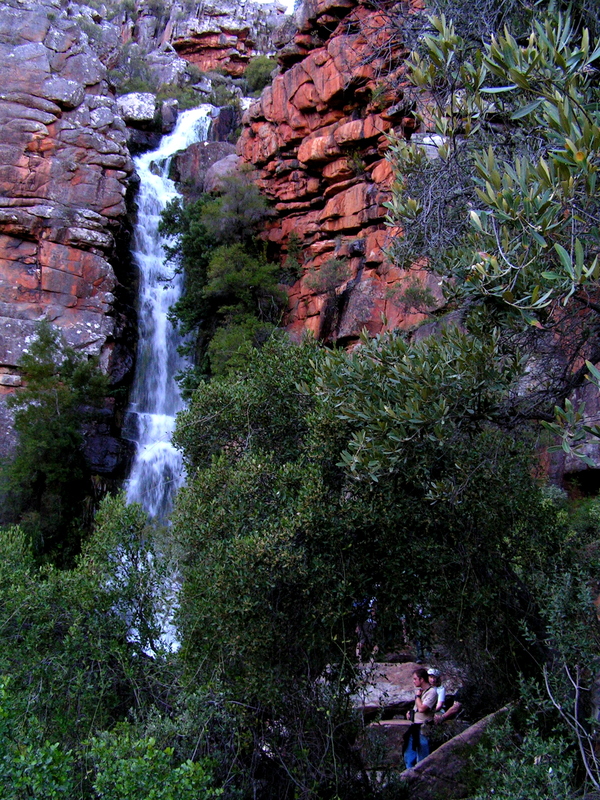 The Cederberg Wilderness, about 300km north of Cape Town, is a world heritage site. It is remote but endowed with stark natural beauty. After setting up the tents, we hiked up a mountain. 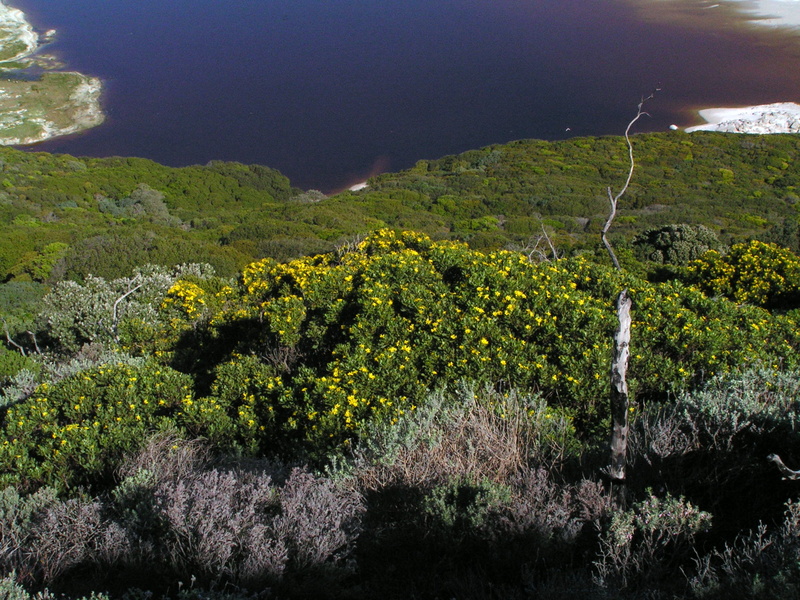 The flora is dominated by mountain fynbos including mountain protea and tiny yellow daisies. On the dry and rocky surface, a small number of trees struggled to grow, naturally stunted with unique shapes. Dazzies, little rodents, lay in the sun. Across this slope, another mountain range rose from the narrow green valley. Numerous natural rock formations added extra appeal to this dramatic landscape. A hiker’s paradise indeed. A waterfall appeared midway tucked away amongst trees. It dropped vertically into the valley below. The stratification of the rock is enhanced by the moisture. It is a cool reprieve from the scorching tilting sun. As I descended, the setting sun cast a dark silhouette in contrast with the bright orange and reddish mountain. 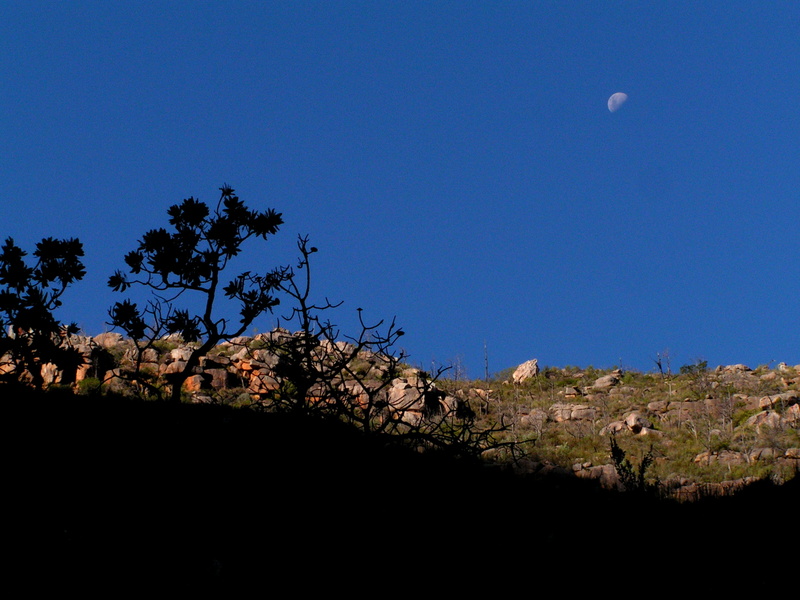 The waning moon appeared behind the mountain against a deep blue cloudless sky. The temperature plummeted too. The light was luminous and my senses heightened. The comfortable bed in Cape Town is now a distant memory as I bedded down for the first night in a tent. The sense of the African adventure permeated through my mind. 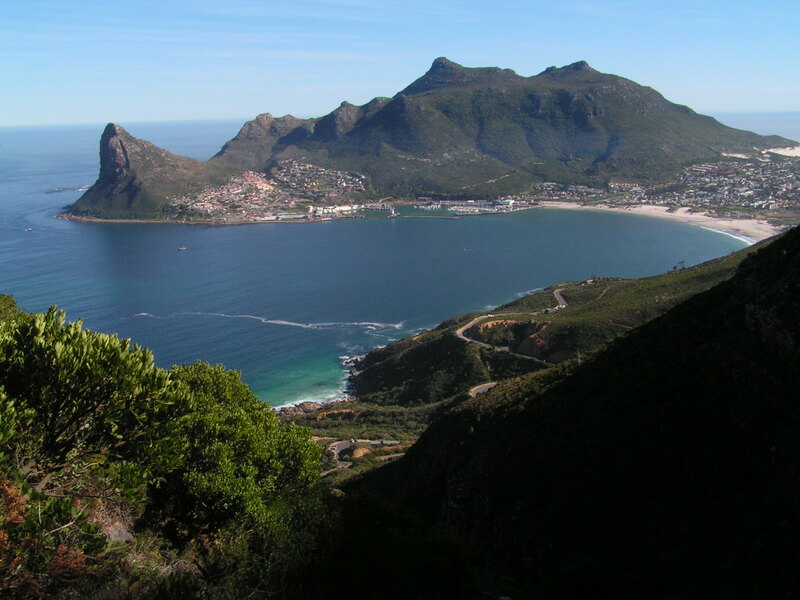 From Hout Bay, the journey continued on the scenic Chapmans Peak Drive. This road is carved onto the rocky steep slope which dropped vertically below into the blue Atlantic. It twists and turns and provides fantastic sceneries along the way. The road stretched from Hout Bay to Noordhoek. It is best appreciated from the few view points along the road. The journey continued past Noordhoek until it emerged into a wilderness rocky area blasted by strong westerly wind and pounding waves onto the high cliff rocky coastline. This is Cape Point at, the end of the African continent. Not quite. Two oceans, Indian and Atlantic do merge but about 150km east at Port Agulhas. However, for romantic reasons, this is the ends of Africa. Beyond this point south, is Antarctica. This is a wind-swept area. Hardy fynbos vegetation are swayed to one side. To the east, beyond the gray mountains and shimmering sea is a vast gray ocean. To the west, wild open blue water. A cable train helped those with weary legs to the lighthouse above. Baboons gathered in numbers amongst the vegetation. On the ledges of this rocky cliff, with a precipitous drop, birds perch into tiny nest. The swirling white water pounded onto the cliff base with fury. Mist arose to sprinkle onto whoever venture here. The last outpost is lonely lighthouse. Solidly built in order to perform its function. 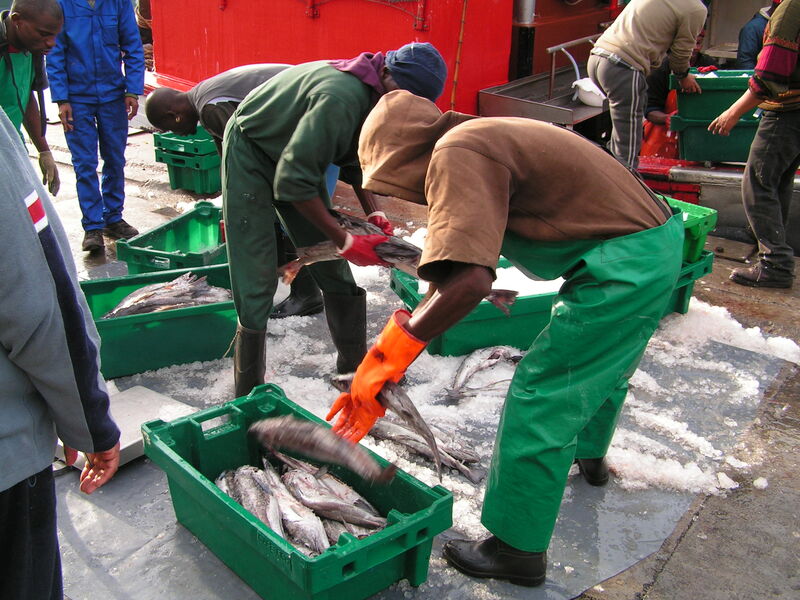 These are dangerous waters to seafarers. Cape Point did not form part of my history memory. The names like Bartholomew Diaz, Vasco da Gama and Alfonso de Albuque [Malaysia history] are linked to the discovery of a passage round the bottom end of Africa. The name Cape of Good Hope is etched in my memory. 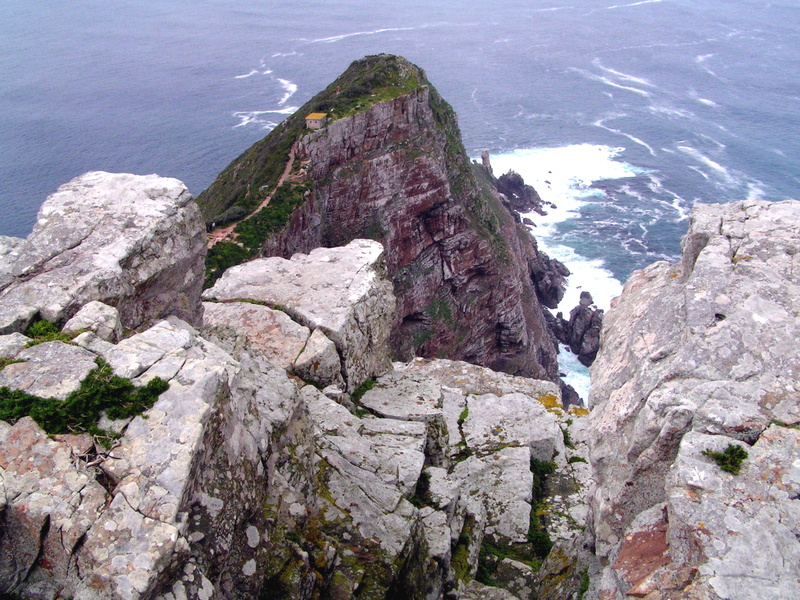 From Cape Point, I looked out towards the west, a tiny peninsula juts out into the torrent sea – the most southerly point of the African continent. It was previously called ‘Cabo Tormentoso’ or Cape of Storms due to its treacherous conditions for sailors. The adjoining white sandy Dias Beach, a hundred meters below, looked inviting. In 2009, I was standing in Isla Navirino, wind-swept bitterly cold island just before Cape Horn, where the Atlantic and Pacific met, in South America. It was a good feeling. 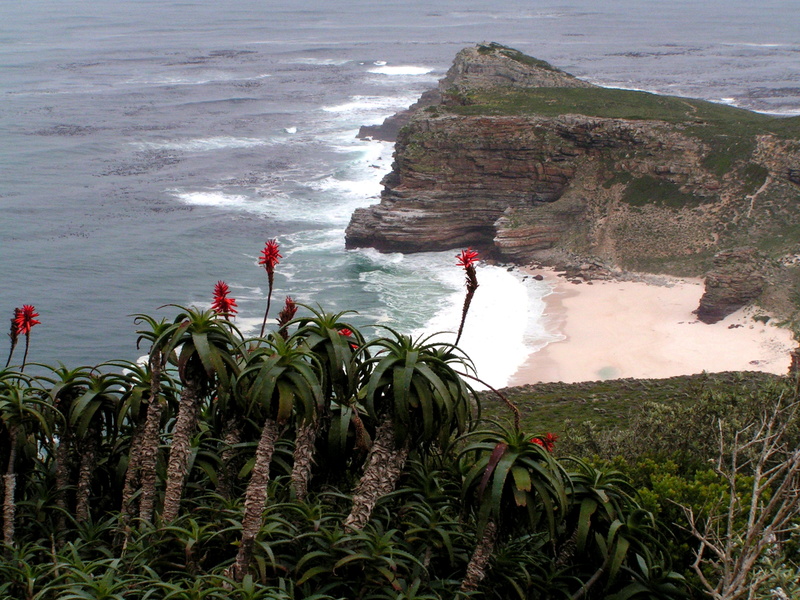 I walked toward Cape of Good Hope, a handsome pair of ostrich trotted across the flat fynbos vegetation prevalent here. It was windy. 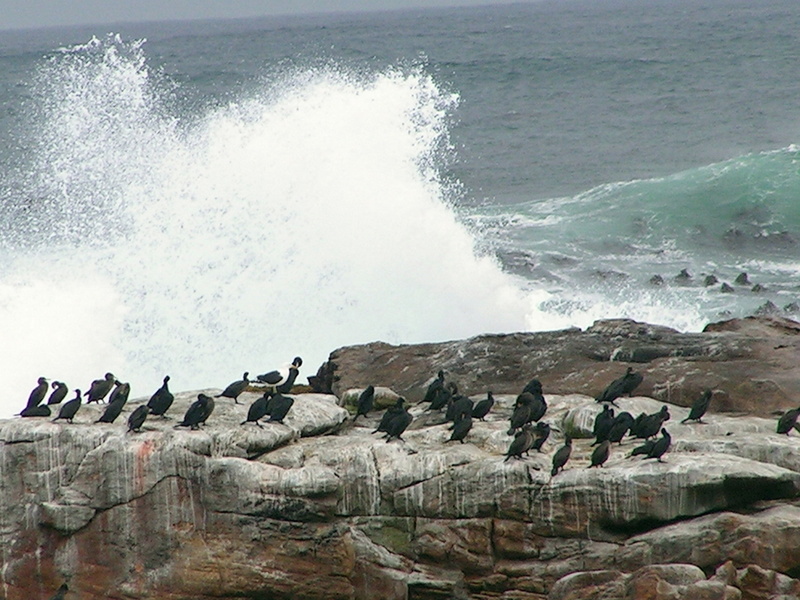 Cormorants rested on rocks smashed by strong waves. Numerous patterns remained etched onto the rocky sandstone cliff that told the story of their past. 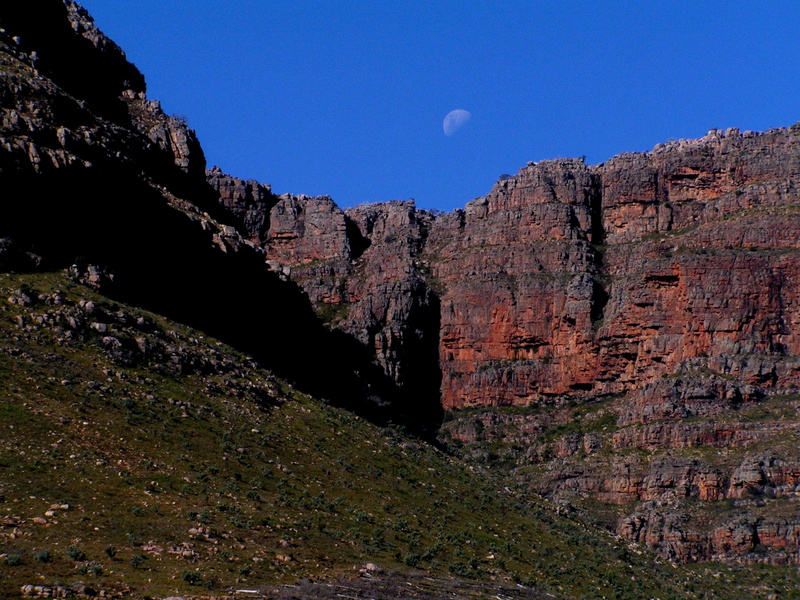 They share similarities with the geology of Table Mountain. This is a highlight for me. It is wild and unspoilt, scenic and rugged. 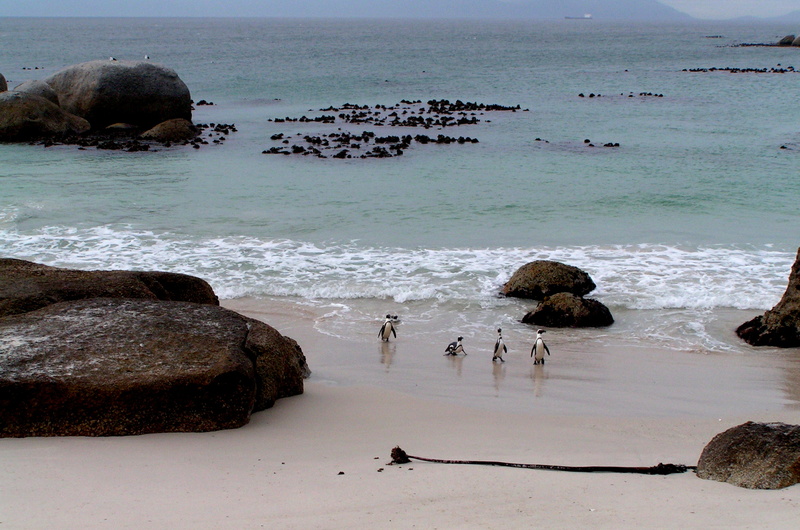 From here, we headed east towards Simons Town to a place called Boulders Beach to watch the lovable African Penguins. It rained and soon we were back to the hotel. I relished my lavish abode, at least for one night. At dinner, I was the only vegetarian at this restaurant that specialised in game meat – zebra, kudu, Springbok and a few more. I could not come to terms with it, although all these animals are farmed. I looked forward to my African adventure. The small group looked accommodating and affable. I like travelling independently, but accessibility into Namib is tricky. This seemed like the next best option. I left the cosy hostel as an independent traveller to join an overland truck tour with Sunway Safaris. Although I enjoy travelling independently where public transport is available, sometimes, some places are difficult to reach due to inaccessibility by local transport. I wanted to explore the Namib Desert region through to Ethosa NP in the north. It is mind-boggling to decide the right company to appoint. Thanks to internet, travel blogs and travelogues, some of the questions may be answered. Who do you trust to part with your hard-earned money? More importantly, are you getting your money’s worth and maximum enjoyment? This journey for most, including myself, may be “one in a life-time experience”. There are numerous companies with a myriad of journeys and activities. The best information would be one from a person whom had traveled with a particular company with positive experience. Those with negative experience will also have a valid story and may suggest other companies suggested by other like-minded travelers. My planning and selection process began months before I landed on the continent. I spent hours reading guide books, overland companies websites and travel blogs. First, the travel itinerary [inclusive of all side trips, treks, walks, sight-seeing, time allocated, etc] and the number of days required. Then its equivalent cost. Second, select five potential companies. Communicate [ask pertinent questions related to the journey – what is and is not provided, cost, extras, group size, type of transport, insurance coverage, medical aid, duration of travel in truck, dietary requirements, emergencies – which may alleviate any lingering doubts] with them and gauge their response. Some are really good but some – refer to website, and some not even a response. Third, make an informed decision. I picked this company which had mostly positive comments and with a suitable itinerary. It did great help when there was a local travel company [in own country] representing this African Overland company. A human voice over the phone and someone you can refer to after the experience. In my overland journey, I must say we did have several moments of uncertainty but was quickly [at times pleasantly stranded and at times, get me out of here] but resolved. Remember, even the best companies, best planned routes and vehicles, especially the vehicles in our case, can break down due to the sometimes extreme weather, terrain, communication, remote locations [that’s exactly what we wanted] and distance traveled. Besides your gear, preparedness and well-being, a good sense of humor and open-mindedness is a pre-requisite. There are several other members of the group, total strangers! Final step, get there and do it. Other issues to consider – vaccinations, medication, right cloths, visas and the usual travel bits. Malaria is a major concern here in Africa. Very early in the morning, I checked into Sweet Olive Guesthouse at affluent Sea Point. My room was exceptional. I wondered if I had paid too much for the comfort. I loved it though, a change after five days in a hostel. At breakfast, I met up with my fellow travelers. Our guides were Chriss and Vouther. A mix of ages but all excited. It was also an opportunity to acquaint with the big red overland truck. It was practical, reasonably comfortable and relatively safe. 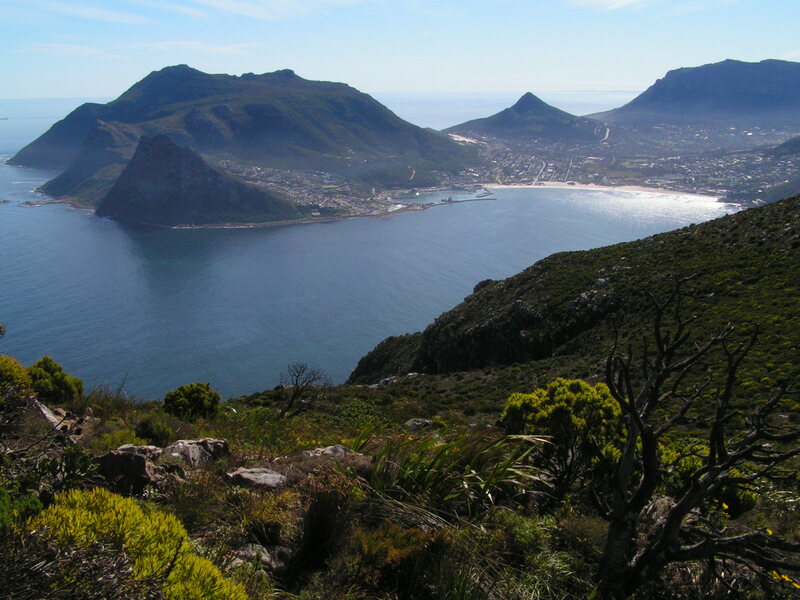 We headed to Signal Hill in Cape Town and later towards picturesque Hout Bay. It was lined with white sandy beach leading towards a bay, homes clustered on the gentle slopes surrounded by towering mountains. The sky was blue with a slight chill near the water. Colorful and rustic fishing boats bobbed up and down with the waves in the calm harbor. A lone seal made this place its home. Sentinel Hill gave a wonderful backdrop to the sheltered waterfront. 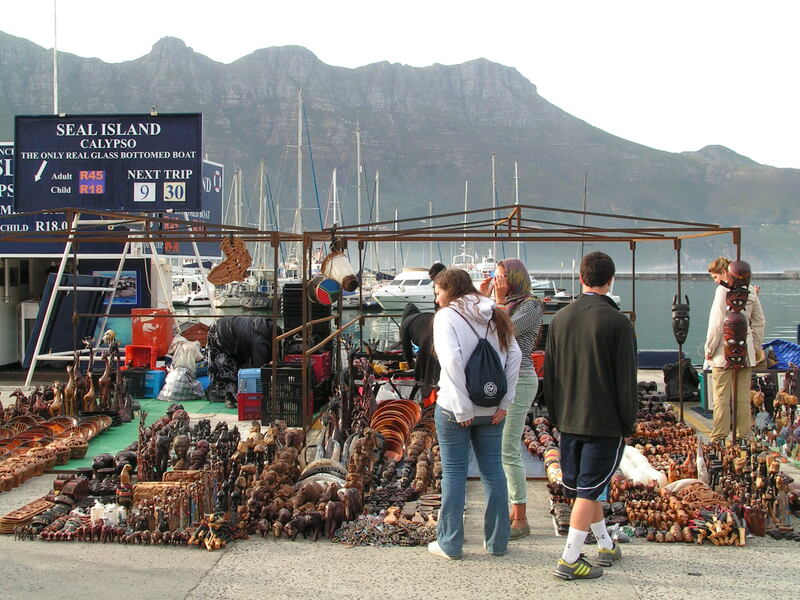 Several curio stalls were set up along the waterfront vied for customers. 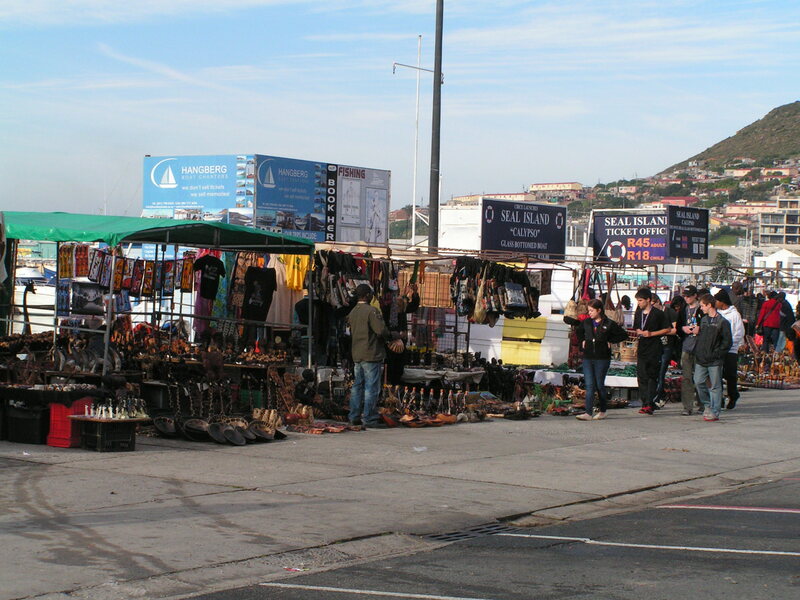 Wood carvings, bone carvings, artificial jewelry, textiles, weaving and many more were on offer. Boats offering trips to view a seal colony was signing up clients. A small band of musicians, brightly clothed, livened up the atmosphere with catchy tunes. My work colleague mentioned about the best thing to do at the pier – eat snook fish or locally called snokie – a type of mackerel. Time was limited. I headed to the Fishermans Wharf restaurant. The interior had the usual trimmings of fish shop. Unfortunately, I was too early. The kitchen grills had just been fired up. Orders were not taken yet. I ordered my fish anyway and explained my predicament. Then, rushed into the reception area. The chef acknowledged my presence. Word had traveled. As the chef handed my prized Snook fish and chip, he quipped, just for you. Our transport was about to move. In the comfort of my seat, not a very atmospheric environment, I savored the steaming fish. It was bony but good. The scent drifted throughout the bus. All eyes were on my lunch. In the gusting wind, I heard voices. I climbed towards the top of the peak over some granite boulders. A few Park Rangers were having a relaxed break. I have been walking for over five hours without any human interaction. A small signage indicated this is indeed Chapmans Peak. The views over the entire Table Mountain National Park was stupendous – Sentinel Peak, Lion Head, Devils Peak and Table Mountain and the Apostles were all visible but hazy in the afternoon sun. Chapmans Peak Drive wound and hugged around the steep mountain slopes with some precarious drops into the Atlantic. 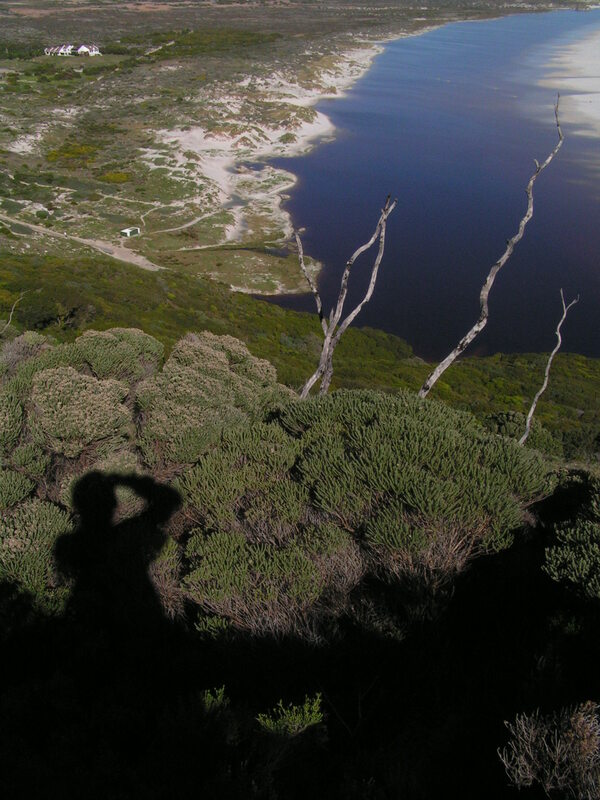 From the peak, I could see a downhill trek that led in the opposite direction towards Noordhoek. A ranger confirmed this. He too enquired about my return journey to Cape Town and informed that there in no transport to the east coast. I was disappointed. 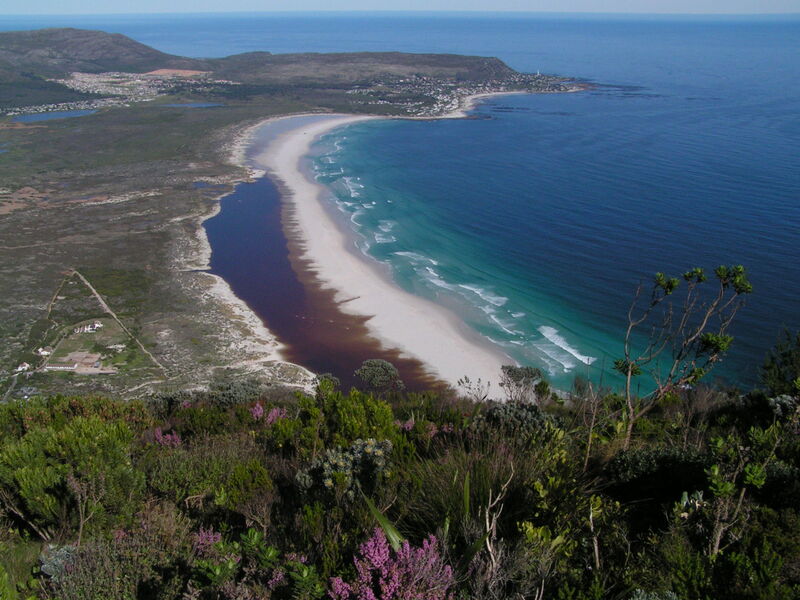 Instead of back tracking, I decided to walk towards Noordhoek. Call me ill-prepared. This downhill trek was steep but gradual, and from the cliffs were vertical drops into the ocean. With a little decent, I was surrounded by the familiar unique fynbos vegetation. Slangkop lighthouse on the coast was like a beacon guiding me to civilisation, hopefully a transport. There were some unique cultivated and manicured vegetation that resembled a cult-like habitat or community. After an hour and a half, descending the last leg on wooden steps, I reached Chapmans Peak Drive road. Noordheok lay several kilometres away. The sun shined intensely. I was tired but determined to continue and await my destiny. I exited this magnificent road after seven hours of walking – longer than I had planned for. I was curious to find a bus stop sign. Where did the bus go to? Perhaps, to Noordhoek. Eventually one did appear after a half hour wait. I was just happy to see one. My legs were not cooperating well at that point. I entered the bus and stared at the driver, not knowing where this bus was travelling to or where my next destination was. There was silent stalemate. The driver just uttered one word, Fish Hoek! Yes, finally the answer to that pondering question that began before I even started out from Cape Town. Answered in one simple word. In my joy, I sat down without paying the driver which he eventually demanded. I wanted to inform all the people whom said there was no transport from here to the west coast that there was one. I was just happy to relax and enjoy the bus journey. 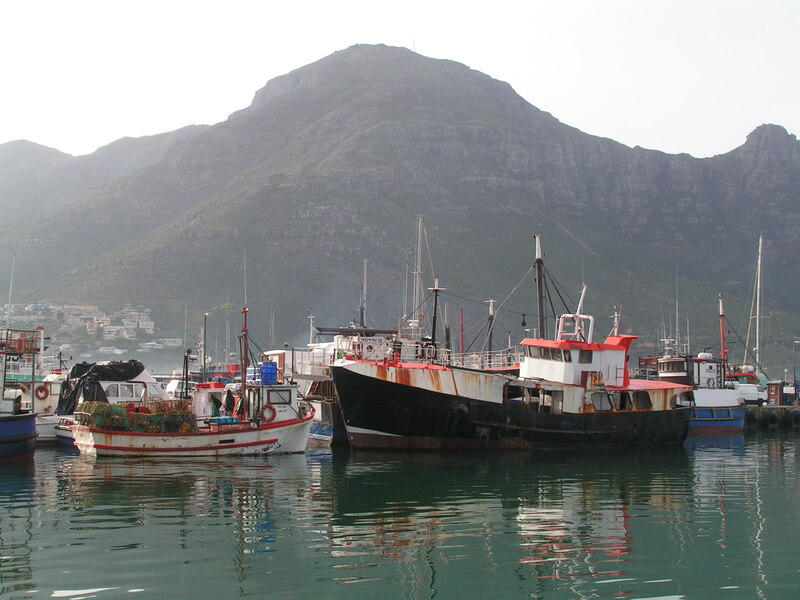 The coastal town of Fish Hoek, on the calm shores of False Bay, smelled of fish and seawater. It was sweet. I boarded a train to Simons Town. A curious little kid kept staring at me. The train route followed the delightful coastline. Houses were built from the narrow flat lowland and led uphill. The main roads ran parallel to the rail tracks. 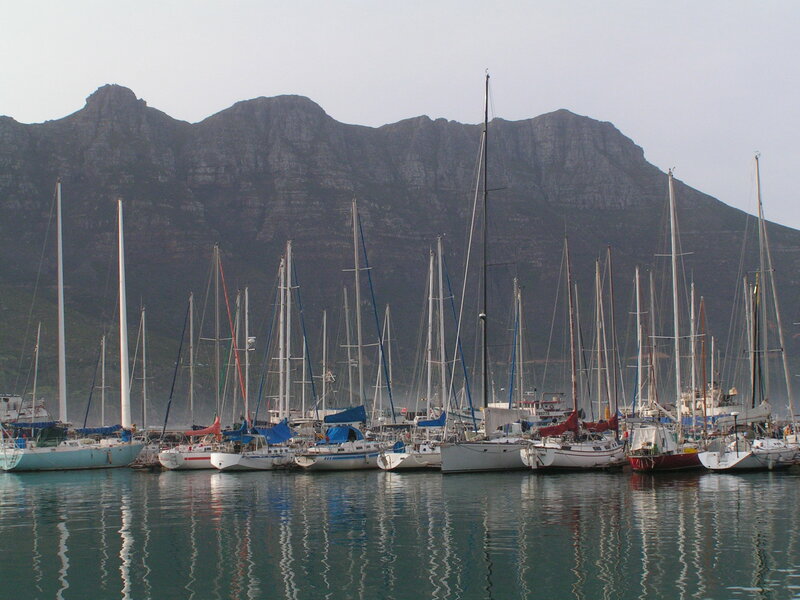 Simons Town lies in a sheltered bay on the east coast of Cape Peninsula protected by the high mountains on the west. From the train station, I walked towards Saint George Street. Classical colonial homes line the waterfront street. Most have been converted into retail outlets. It is a lovely stroll amongst these wonderful architecture buildings. It is not quite “Africa”. 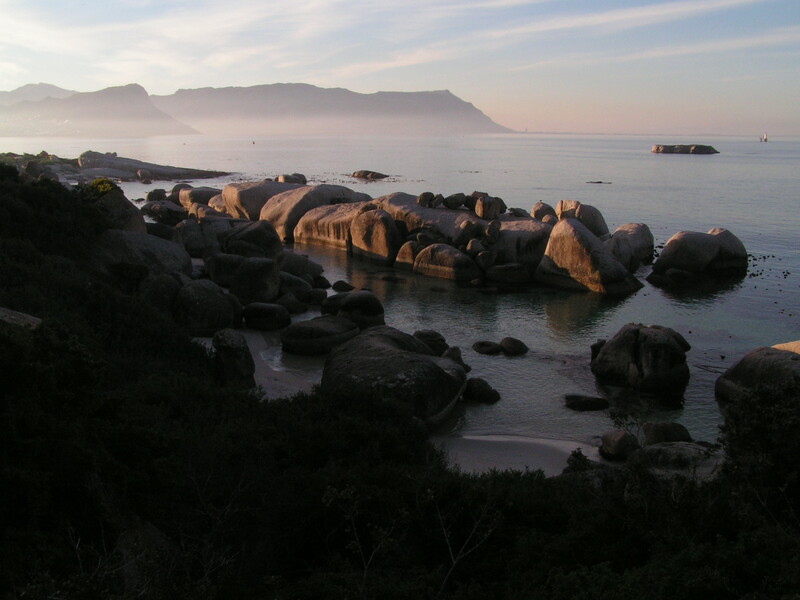 From here, a few kilometres lies the popular Boulders Beach. 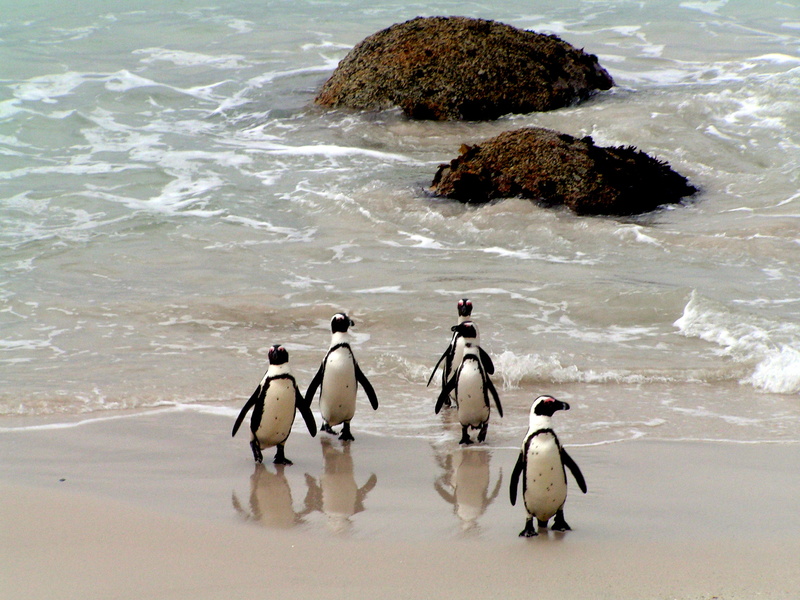 Its popularity comes from the permanent colony of African of Jackass Penguins. Within the conservation area, they build nest into the sand and under the canopy of shrubs. They are not disturbed by presence of humans. At one section, you can get into the water and swim with the penguins. It was an experience seeing these petite creatures going about their daily routine in their natural surroundings. Large rounded granite boulders added a dramatic landscape especially in the setting sun against the deep blue water. In the distant, silhouettes of boats and land created a tranquil setting. I rushed back to town and eventually caught the last Metro Train back to Cape Town passing through lovely and quaint water front towns of Kalk Bay and Muizenberg. It had been a long day but the efforts were worth it. This journey eventually did bring to light about accessibility with local transport on the southern peninsula, west coast to the east coast and vice-versa. I went with little hope and lots of determination and eventually found a, rather relieved, solution. The taxi driver waited patiently at the hostel. 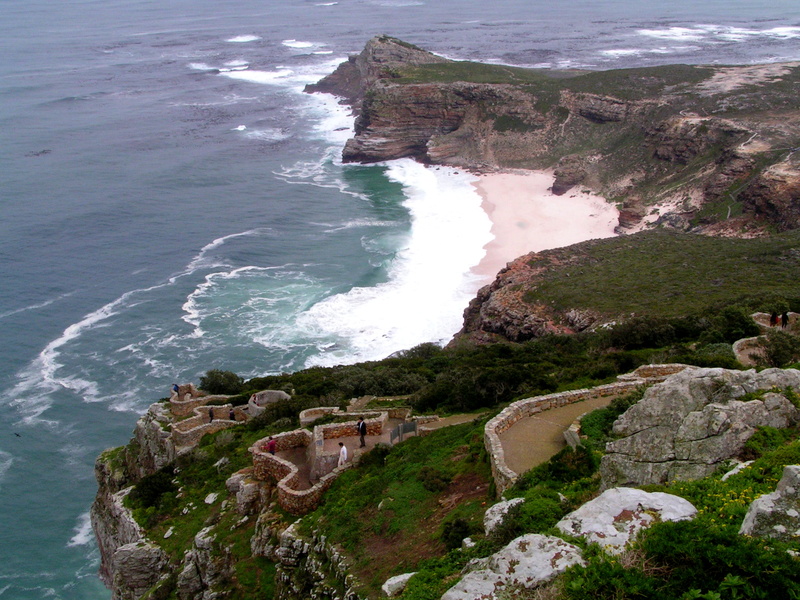 I planned to hike the affectionately named, the Chappies – Chapmans Peak on the Atlantic Coast between Hout Bay and Noordhoek. I had no choice but to hire an expensive taxi ride as there were no public transport on Chapmans Peak Drive. It was around 9 am when I was dropped off just before the toll on Chapmans Peak Drive. It was a lovely ride along the coast passing through picturesque towns, white sandy beaches and secluded coves and bays. I approached two elderly women whom were waiting for their transport. I enquired about the starting point towards Chapmans Peak. They looked with bewilderment! They were curious to know how I would return to Cape Town, is anyone aware of my plan and whereabouts and if I had any cell phone for emergencies. My simple answer to all their queries was negative. They were concerned. I thought I would just walk as long as possible and hopefully get a ride back to the Mother City. I just wanted to walk. They informed me that the starting point was several kilometres away. On this narrow road, sandwiched between the Atlantic and the vertical and rocky Apostles, I weighted my options. There was a trek just above the road. It looked steep. They informed me that this will also take me to Chapmans Peak but required an additional two hours. I had time. Today was sunny with a clear deep blue sky. On the mountain slope however, a dark shadow dominated the slopes as the sun was still below the peaks. The air was crisp and smelled fresh. It lifted my spirits. I walked uphill past remains of a stone fort into a gully like rocky trek. 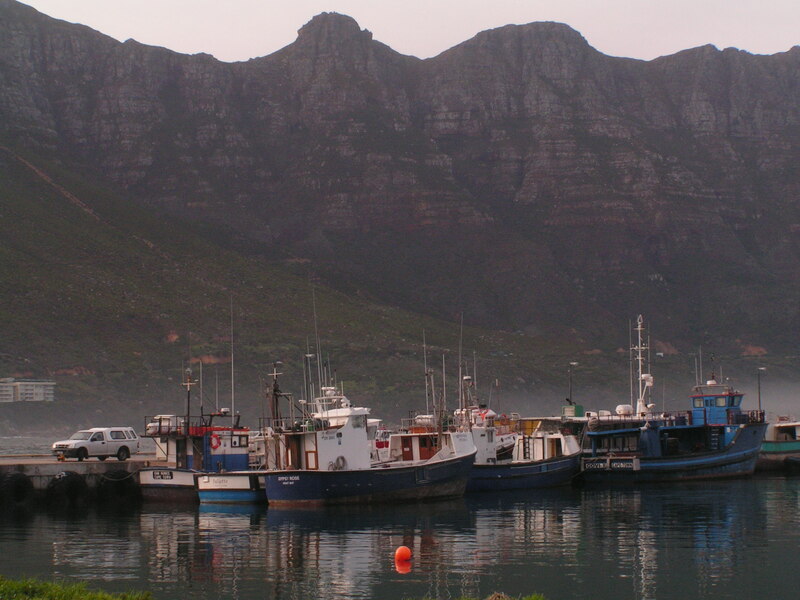 With a little elevation, the early morning views of Sentinel Peak, the working harbour at Hout Bay and the shimmering deep blue sea was stunning. The foreground however was darkened in the shadow of the great mountain peaks. Unlike trekking on Table Mountain, today, the fynbos vegetation and numerous varieties of Proteases were exposed. The flora was distinctive, quite unlike any vegetation that I had witnessed. I loved the wilderness and the isolation. A jogger with a dog in tow went past and I just reconfirmed that I was on the right trek. 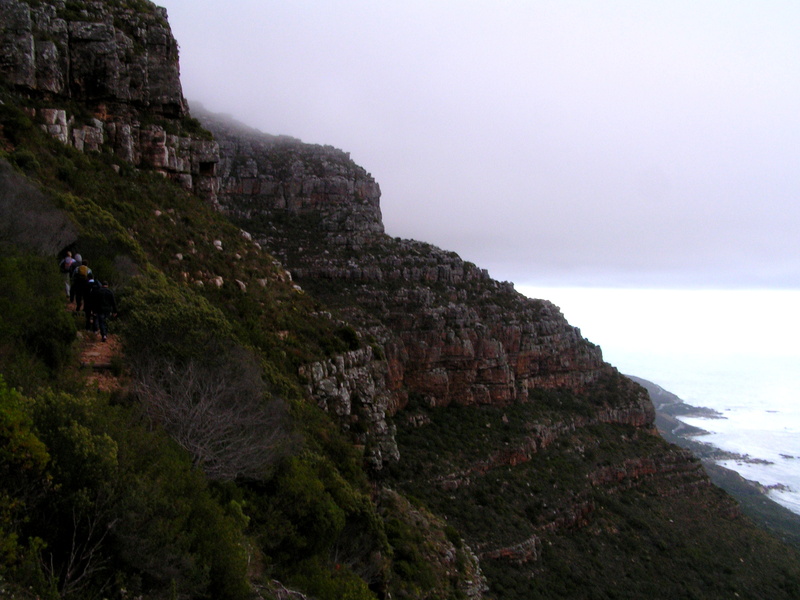 I was alone with the elements and the rocky slopes of the formidable Apostles of Table Mountain. 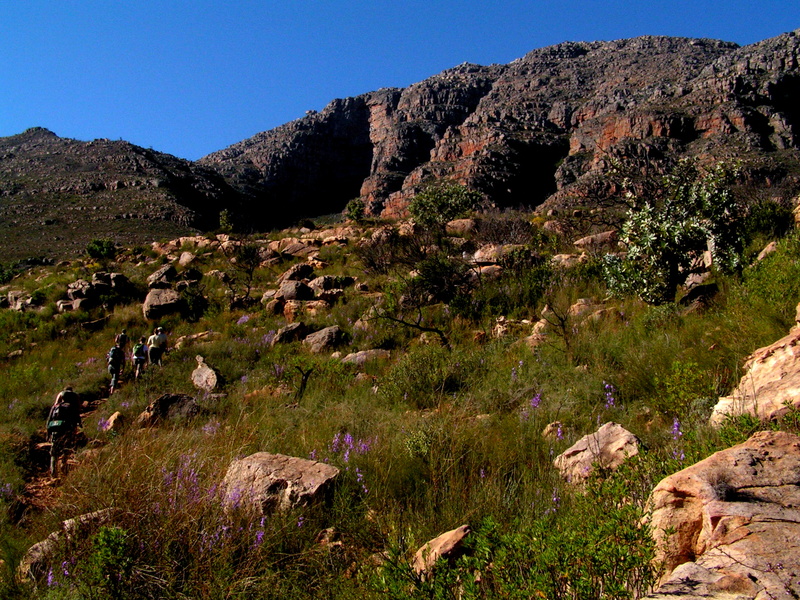 The well maintained rocky trek seemed to lead toward Chapmans Peak. At least that is what I had thought. My trek was soon, blissfully welcoming, was side-tracked to little fluttering rainbow coloured birds. The Sunbird. I was amazed with its wonderful array of colours and its fearless nature. 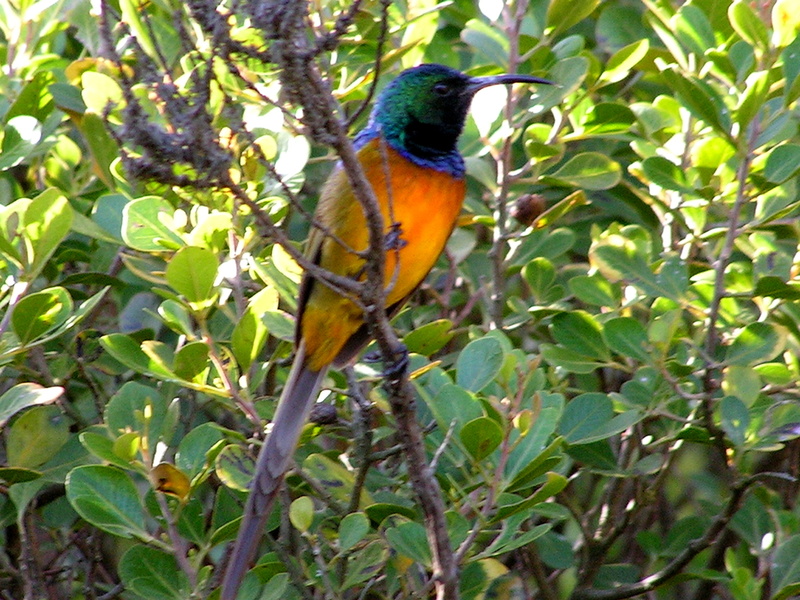 The varieties of Sunbird was numerous – hues of yellow, blue, green, red, purple. All shimmered in the soft morning sun. They flew in short burst, sometimes hovered over flowers, like humming birds, feeding on the sweet nectar. They darted from one flower to another in quick succession. I wanted to capture these industrious birds on camera. I aimed and pointed but as I released the shutter, they moved to another site just a meter away. I tried numerous times and the result was the same, out of focus or totally devoid of the subject. My trek was slowed down as I was determined to capture just one picture in focus. I walked back and forth chasing the magical Sunbird. The trek became “chasing the Sunbird trek”. The sun was already up above the rocky mountains, the views toward the water and the surroundings, became more impressive. White waves created by fishing boats leaving the harbour disturbed the otherwise still deep blue water. The dark shadow cast by the mountain extended towards the edge which dropped into the ocean below. 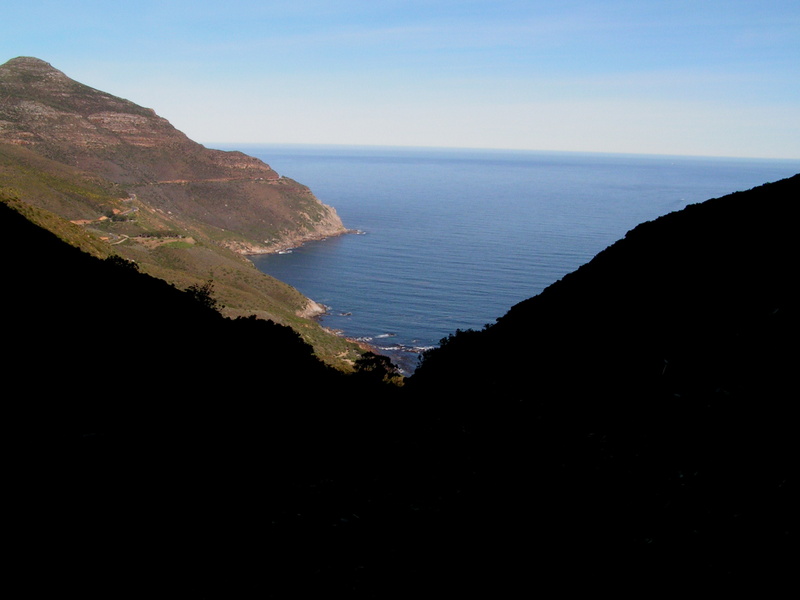 A winding road, Chapmans Peak Drive, was wedged between the mountain and the sea. I told myself to get going and not be absorbed by the wonderful birds. I walked past a refreshing waterfall with an assortment of luxurious trees and shrubs literally below my feet. From here it seemed to be a long way up. I finally reached the “starting point” after two hours. From here-on the trek led uphill. The illustrious fynbos vegetation weaned off and left only with irregular rocks. I was alone with only a slight breeze and the blistering sun for company. Here, the formidable mountain was tumbling towards it birthplace, the sea. I reached the top of the peak. I was surprised that there stood another peak, completely obscured earlier. However, the impressive views continued. I habitually do not wear a watch. The sun was high. It was nearing midday. I was a little concerned with time but brushed it aside. The journey took precedence. A downhill walk led me to an intersection and a little sign indicating some directions. One led uphill into the mountains and the other, which I took, led towards a mountain peak. On a ridge in an open high meadow, the wind blew strongly. 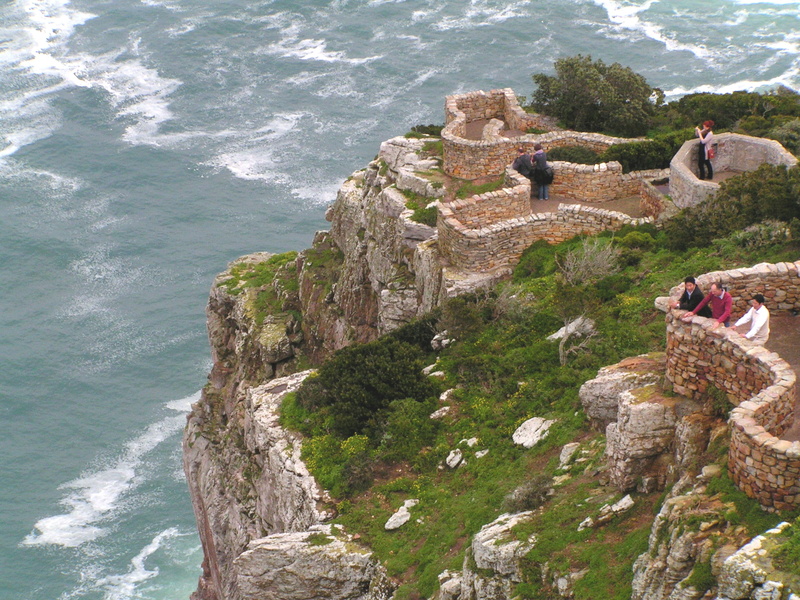 From here I had my first view of the Ends’ of Africa – Cape Point. The white sandy beach coastline on the Atlantic stretched a long way . 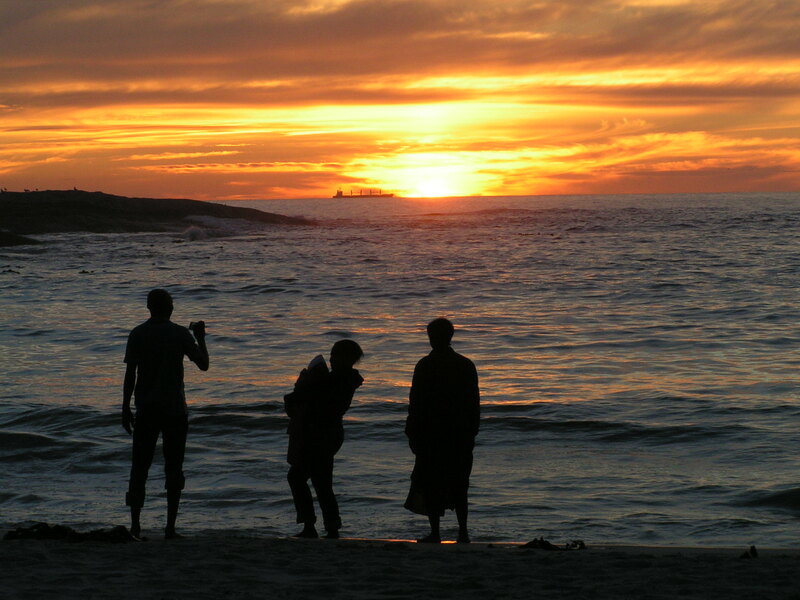 Several townships lay below on the south-west coast – Noordhoek, Slangkop and Kommetjie. In the distant south east was the coastal town of Fish Hoek, on the shimmering False Bay – hopefully my next destination. Before coming here, I was informed that there is no transport to Fish Hoek from the west. My only option to return to Cape Town was to get a ride back by road to Hout Bay via the Chapmans Peak Drive! I just took my chances and hopefully a kind soul would help me along the way. In the worst case scenario, I may need to catch an expensive taxi ride back, something that was in the back on my mind. I was out of bed early. I looked out of my hostel and the top of Table Mountain was draped in thick white clouds. It was slightly breezy with heavy cold moisture in the air. 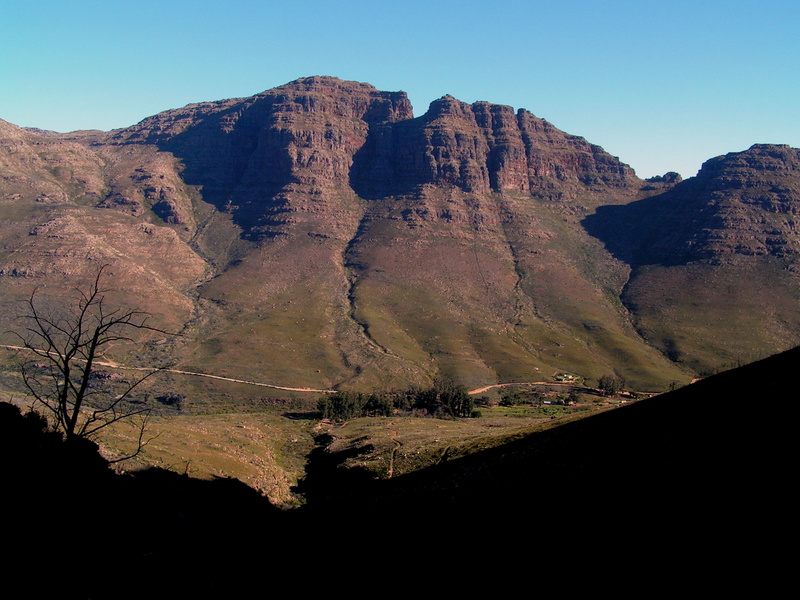 Today I met my guide, Margaret – Table Mountain Walks, whom would take me trekking the iconic flat top Table Mountain. 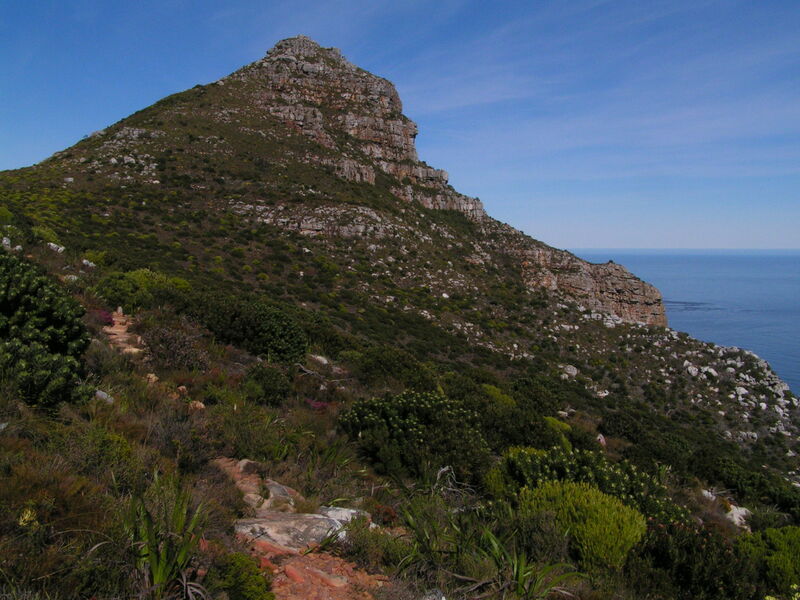 At the foot of the mountain, near Camps Bay, the Kasteelsproot Trail was the starting point of the walk. The flat mountain top was completely draped in a cloth of mist. However, the lower pancake like colorful sandstone strata with myriad hues of orange was exposed. 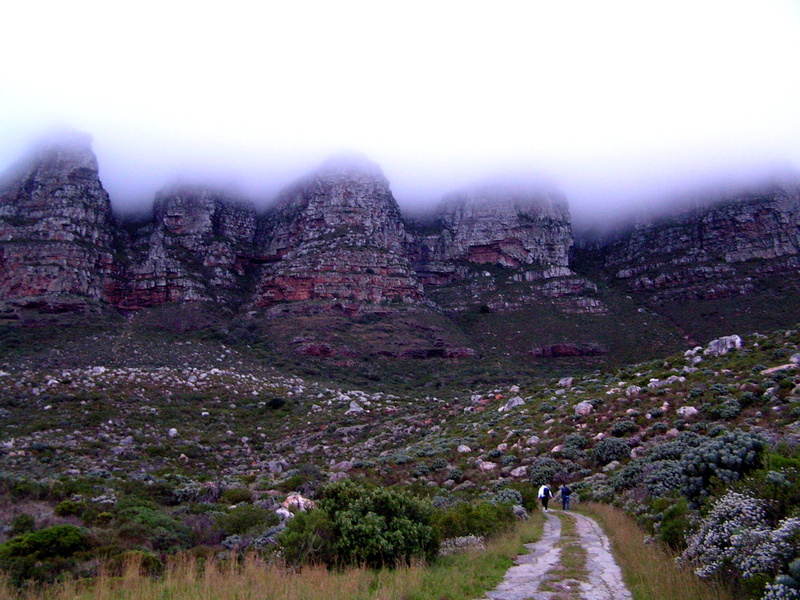 Narrow and rocky trails lead uphill into the Apostles and towards the thick clouds. 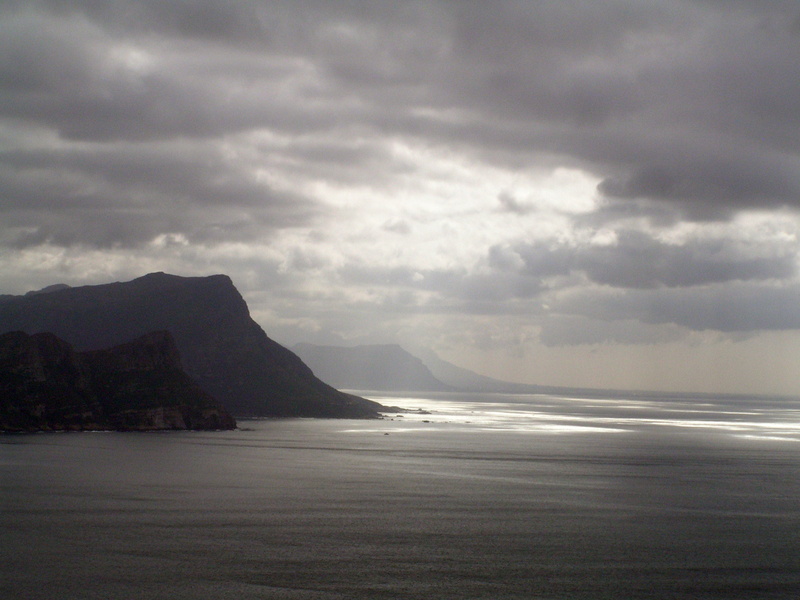 Views of Lion Head and Robben Island was now a hazy distance. The electric blue of the Atlantic dominated the horizon. In the south, the land is exposed to the harsh ocean waves. The uphill trail led straight into the clouds. This is the “Back Table”. The landscape turned into a dreamy world. Distant views were inhibited but the immediate became pronounced. The air turned chilly as the light wind blew across the valley and hills. There were no boundaries. 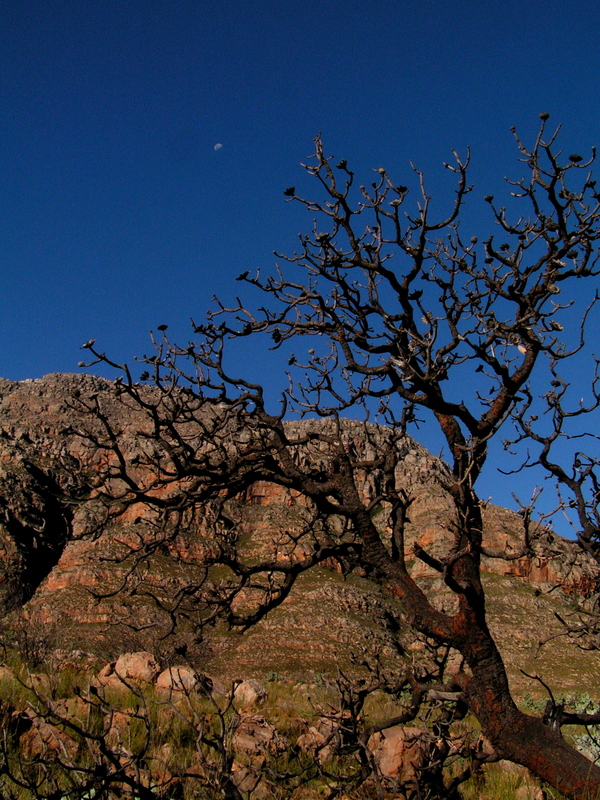 The mountainscape resembled a primordial landscape filled with native fynbos vegetation. 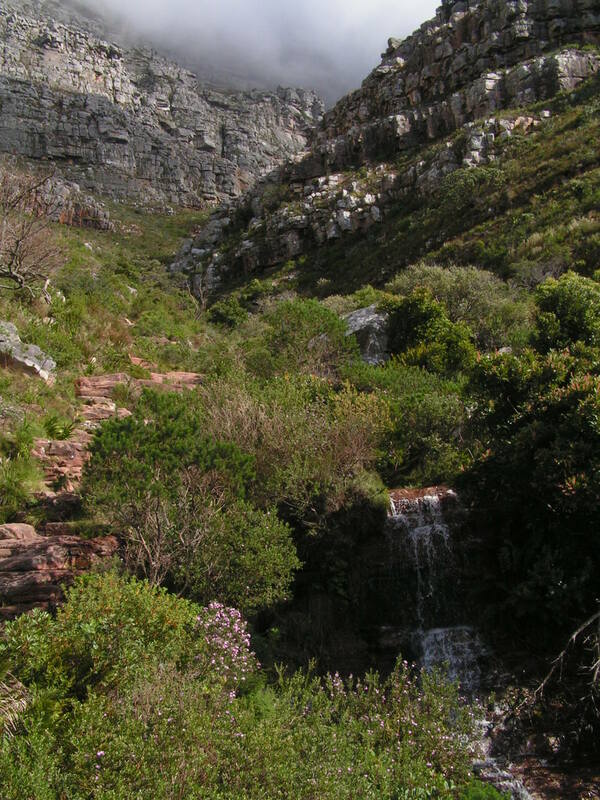 This vegetation is unique to this area of Cape Peninsula. The most recognisable plant here is the large-flowered Proteus. The terrain and land-form constantly transformed with every shift of the mist aided by the wind. Melodies of bird calls transcended into the valleys and hills. The views in the brochures of isolated coastlines and picturesque coastal towns in the valleys below were absent. In contrast, I felt excited and invigorated to walk, though carefully, through this idyllic and primitive environment. At the Valley of Gods, the red sandstone rocks that had tumbled down years before dominated the landscape. Orange lichens together with Old Man’s Beard flourished helped by the abundant moisture. At times, although rarely on this occasion, the clouds would relent and exposed the beautiful valleys and the blue Atlantic on the south-western coastline. I was still hopeful the mist would lift. Perhaps it was wishful thinking. Tall grasses, shrubs and stunted trees clustered together in large numbers inter spaced between rock boulders and tumbling cliff faces. 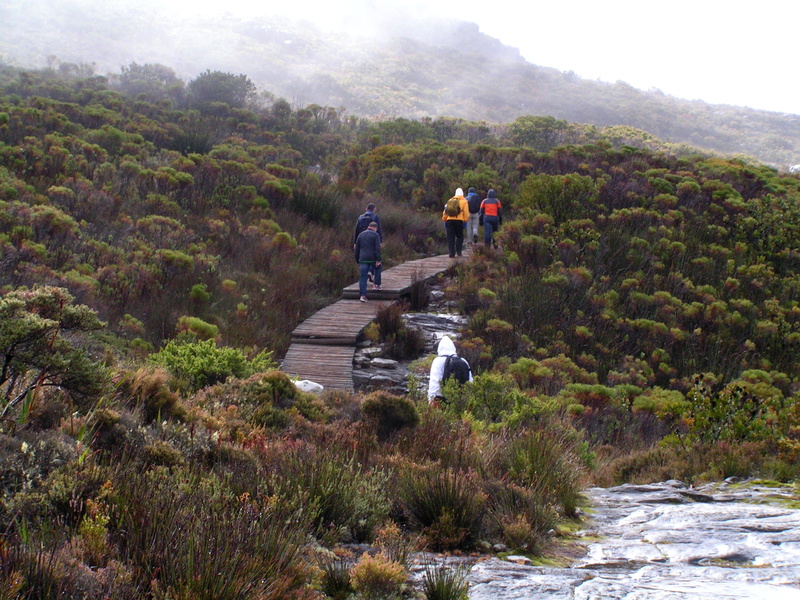 The trail continued through the mist into Echo Valley and Isolation Valley through more rock boulders, swamps, grasslands and boardwalk towards the Eastern Table. Birds occasionally flew past hurriedly. We finally reached McClear Beacon, the highest point on the mountain at 1086m. A small pile of stone rubble marked the point. After a wonderful lunch, the trail continued on relatively flat terrain. The clouds continued to tease with majestic views but only briefly. The trail seemed to be the ends of earth. The end was nowhere as it was completely obscured by the mist. At places, I felt it was precariously close to falling over the cliff. One wrong step may send me into an abyss. I am glad that I had a wonderful and knowledgeable guide, Margret, with me. We reached the top of the Plaketipp Trail on the “Front Table”. A rocky gully, between two large hills, led downhill. The surfaces were slippery and sometimes my boots lost traction. There were hikers ascending from the Lower Cable Station. Without warning, beautiful views of the Lion Head, Signal Hill, City Bowl – Mother City and beyond emerged as the sun shone brightly. I had exited the recalcitrant cloud bubble. My wishful thinking at the beginning of the trek did not materialise. The downhill trail was tough and steep at places. The eight-hour walk had taken in the various parts of the mountain and enabled a close encounter with the natural and ancient flora. This trail, with a capable guide, had been phenomenal, though hazy, misty, cloudy, obscure, foggy……….through a mystical landscape. I caught the shiny Red Bus double-decker at bustling cobble stoned Green Market Square. 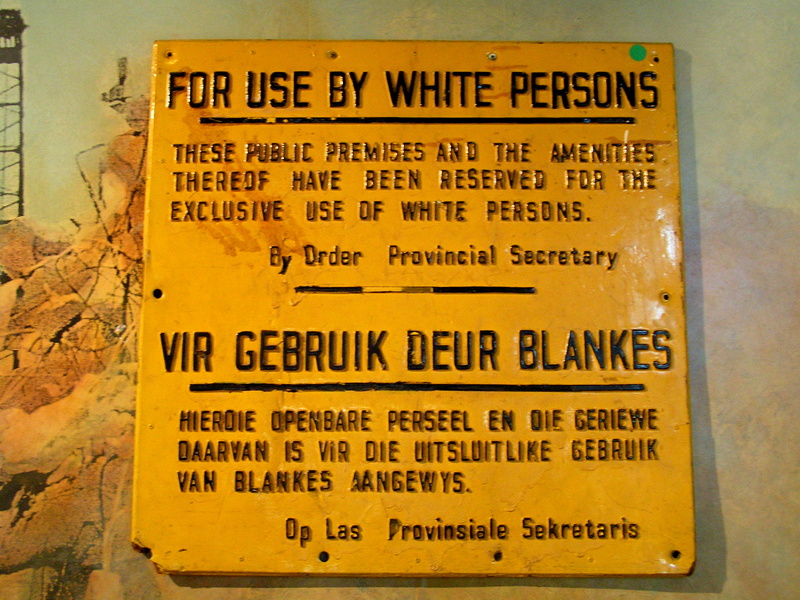 There are a couple of museums here in Cape Town and there was one that I did not want to miss, District Six museum. Here lies one of the many atrocities carried out during the apartheid regime. Poignant reminders fill the walls where over 60000 people; immigrants , colored and slave origin, were forcibly removed from this area to may way for white only area. Communities were broken up. On the ground floor is a map of the area. 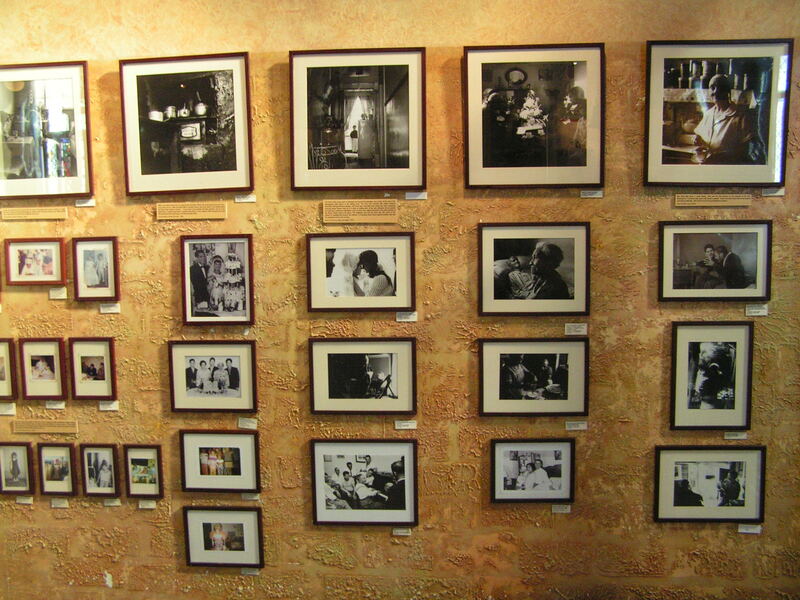 Some had left handwritten notes, artefacts of the by-gone era together with black and white pictures filled the walls. They all told a story. The regime had flattened their home but the resilience and spirit of the former residents was never diminished. It was an emotional and sombre walk around the building. Just to comprehend the Apartheid rule was difficult, let alone the human casualties left behind. I guess it is a place for reflection. There is a lovely cafe inside the building. A friendly smile and a hot cup of coffee did cheer me up. 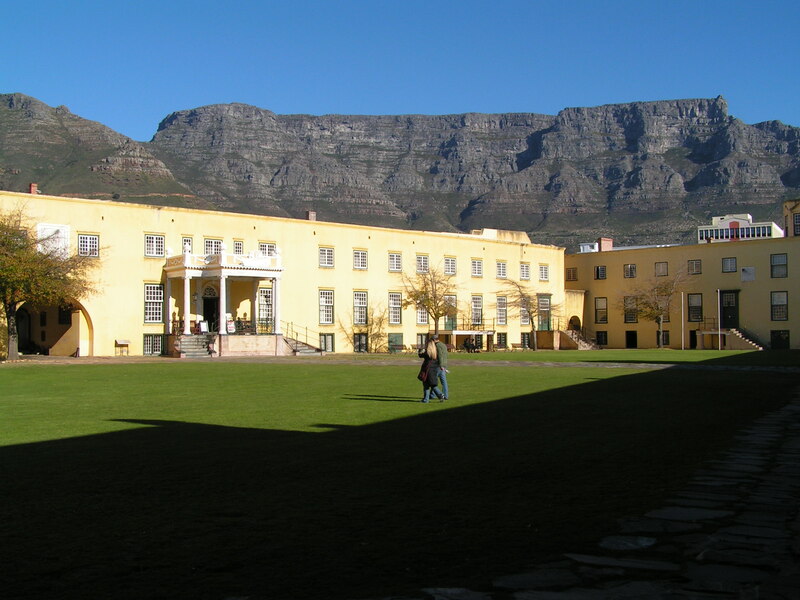 I walked to the possibly the oldest colonial building in Cape Town – the Castle of Good Hope. This fort was built by the Dutch East India Company in the 17th Century and was constructed in a pentagon shape. There were no guides available. I walked around the large grassy courtyard and around from one bastion to another. The interiors were decorated with fine fittings, polished wooden tables, paintings and other extravagances of a colonial era. However, I found it lacking – plenty of space with little, information and signage about the various rooms and surroundings were lacking . Maybe I missed getting an info pack at the ticket counter. The fountain area was impressive and equally was the views of the Table Mountain. A great insight to the workings and opulence of the colonial masters. A walk with a guide would be enriching. The sun continued to shine brightly. The sun was already setting as I jumped back on the Red Top Bus. It pulled out of the city and headed up towards Table Mountain. 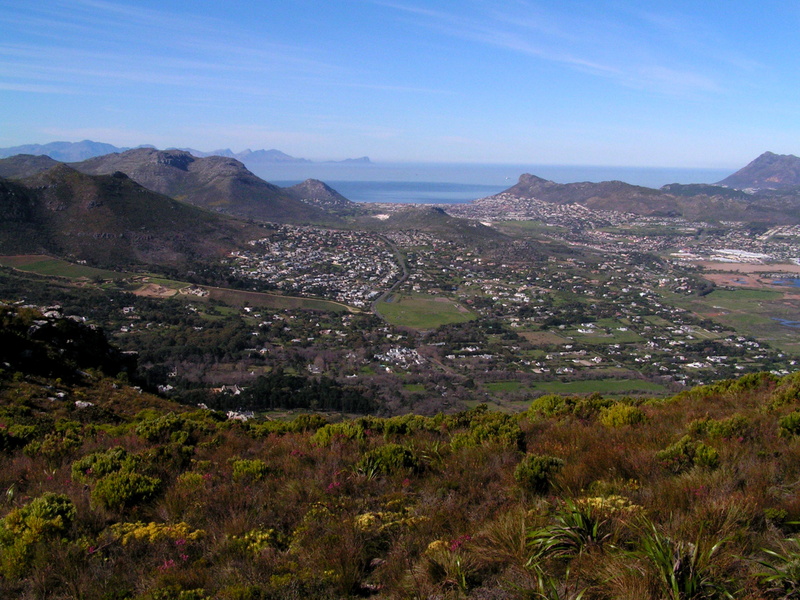 There was a magnificent view of the City Bowl, harbor Devil’s Peak, Lion Head and Signal Hill. Table Mountain was quite impressive and looked formidable. The following day, I will be trekking to the top, weather permitting. The coastline and the deep blue Atlantic was impressive. 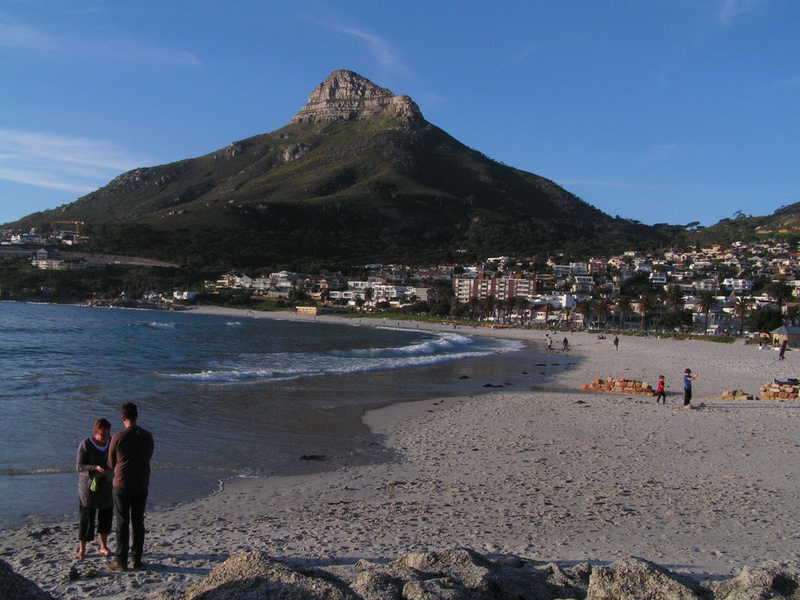 Cape Town is well endowed with natural landscape and an enviable location. On the mountain, the cable cars were operating or perhaps closed for maintenance. The last destination for me was to Champs Bay. A beautiful and effluent neighborhood with white sandy beach with boulders protruding on both ends of the beach. 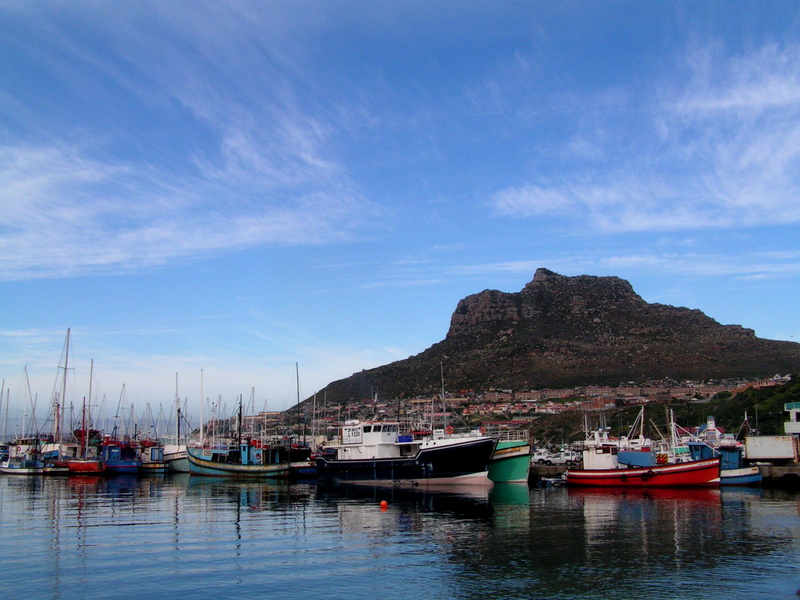 The backdrop is the imposing Twelve Apostles and Table Mountain. Cafes, petite retail outlets and bars lined the busy streets with both tourist and locals milling about. Seafood is popular here. The sky turned orange as the sun began to set. The tilting evening glow lit up the sandstone mountains that created amazing warm and picturesque views. On the beach, kids and families played. Joggers took advantage the late sun. The horizon was now bright red and orange as the sun descended towards the horizon. A cargo ship on the horizon headed towards the port. It was a magnetic sight as only silhouettes of people and dogs stood in admiration of the glowing star. From here the Red Bus followed the contour of the land along several beach neighbourhoods and returned to the Aquarium at V and A Waterfront. This is a great and convenient way to get to places or just to get oriented to Cape Town. 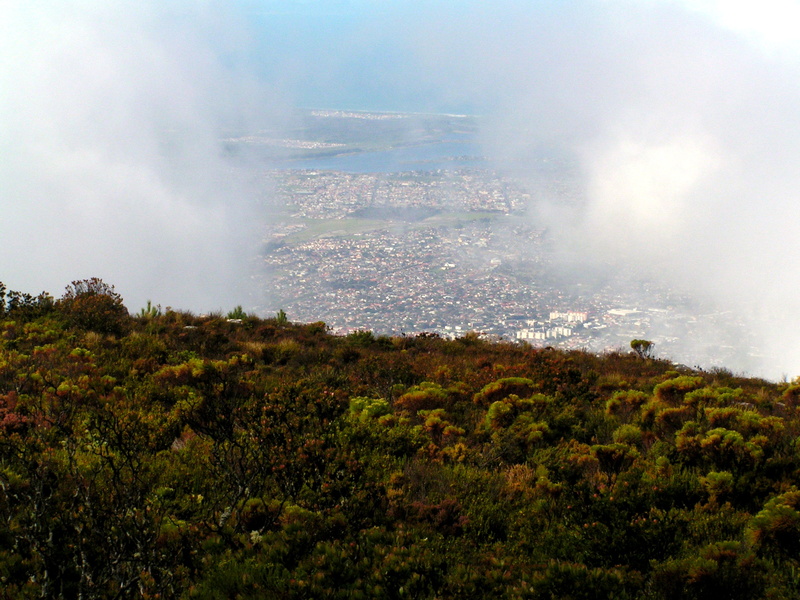 There is another route that goes behind the Table Mountain, through the Botanical Gardens – the Blue Bus.